The Great Seal of the United States was adopted on June 20, 1782 and since then the American Bald Eagle has been recognized as our official bird. The bald eagle embodies the boundless spirit of freedom. With a wingspan of up to eight feet, majestic looks and great strength it soars effortlessly through the grandeur of Nature. It has a sense of power and purpose in the air, a master of its destiny and domain. 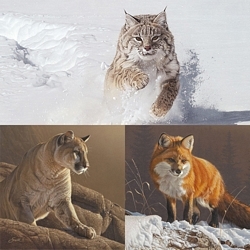 Daniel Smith’s "American Icon" shows why he is regarded as one of the greatest wildlife painters working today. This Limited Edition Fine Art Canvas is a work of intricate design, impeccable artistic rendering and compelling narrative ― the hallmarks of a great work of art.